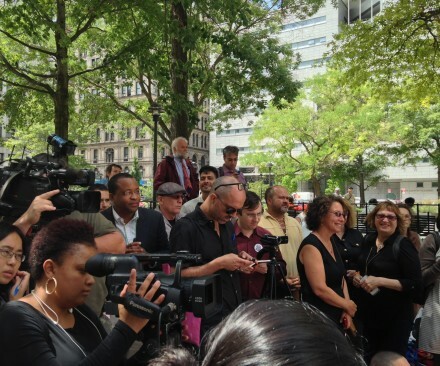 Earlier this afternoon, students, professors, politicians and more gathered to protest Cooper Union‘s decision to institute tuition for the upcoming school year. The alma mater of artists such as George Segal, Alex Katz, and Eva Hesse, Cooper Union has traditionally been a tuition-free school, offering opportunities to study art, architecture, and engineering to those who might not be able to afford other programs of equal quality. 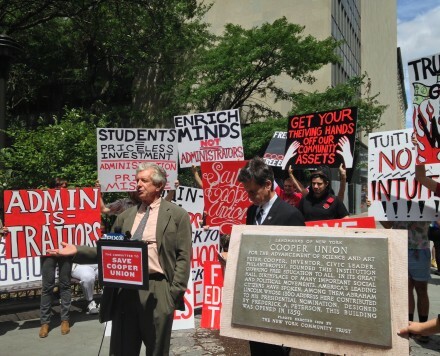 When Cooper Union announced in 2013 that it would begin to charge tuition in the fall of 2014, the backlash was immediate as students organized sit-ins, occupations, and, earlier this year, a lawsuit filed against the school’s Board of Trustees by the Committee to Save Cooper Union (CSCU). The Bruce High Quality Foundation, an arts collective founded with members primarily drawn from Cooper Union graduates, has also been active in their support of CSCU. 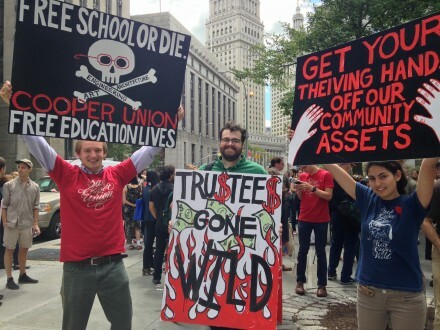 With the fall semester looming, protestors gathered outside the New York Supreme Court, many holding colorful signs with slogans such as “If it ain’t free, it ain’t Cooper” and “Get your thieving hands off our community assets”. The rally featured five speakers. The first two were Richard Emery, the lawyer representing the plaintiffs, and Brad Hoylman, a New York State Senator. 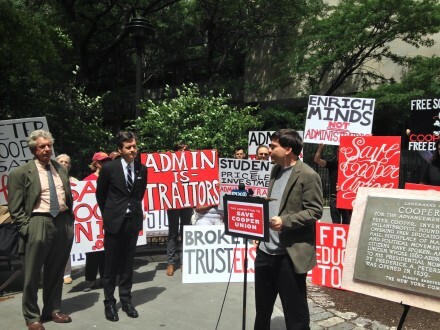 Emery spoke against “changing the fundamental nature of the school” and the “risky business of the trustees”, while Hoylman brought attention to the legal and financial ramifications of establishing tuition. 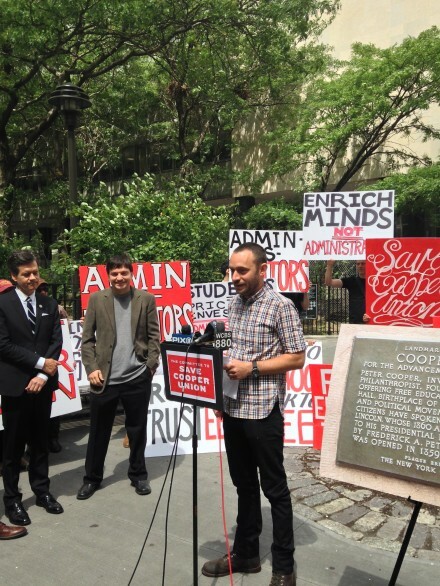 In particular, he stressed that Cooper Union’s tax exemptions on the property it owns under the Chrysler Building are prefaced on a tradition of free admission and thus might have to be reconsidered should the school charge tuition . The final three speakers were members of the Cooper Union community. Alumnus and founder of CSCU Union Adrian Burton Jovanovich spoke about the shock he felt at the school’s decision and “the need to demand accountability” for what he feels was extravagant and unsound spending on the part of the administration. Jovanovich’s sentiments were echoed by Claire Kleinman, who will be a freshman at Cooper Union in the fall and thus among the first to be affected by the planned changes. Holding the tuition statement she recently received, she expressed her disappointment in the institution and reminded listeners that “money and worth are two separate entities”. The final speaker was Ben Degan, who has been both a student and teacher at Cooper Union. Calling Cooper Union “one of the truest meritocracies”, he stressed the importance of keeping money and education separate in order to preserve the integrity of the institution. 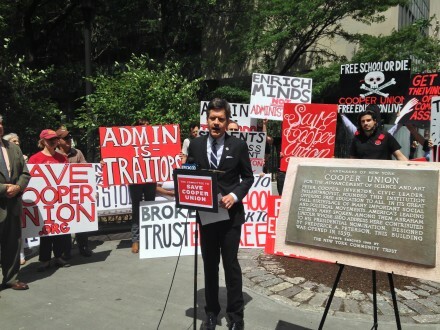 His final statement was met with applause as he reaffirmed the Committee’s stance and said: “We will not stop defending our asset; Free Cooper Union”. This entry was posted on Friday, August 15th, 2014 at 6:04 pm	and is filed under Art News. You can follow any responses to this entry through the RSS 2.0 feed. You can leave a response, or trackback from your own site.